This lovely home is nestled on a beautiful 2.66 acre lot within the town limits of Thomaston. The main floor features 4 bedrooms, 2 bathrooms, living room, den, kitchen, dining room and spacious laundry room. The recently updated open concept kitchen showcases a large island, new cabinetry, granite countertops, tile back splash, stainless steel appliances, including a gas stove, side by side refrigerator and dishwasher. All of this, along with pretty pendent lighting and canned lights are presented with a neutral white, silver and grey palette. The kitchen opens into the living/family room where you will find a wall of windows, providing lots of natural light and scenic views, beautiful wood plank laminate flooring, fireplace, ceiling fan and canned lighting. The family room flows into a generous dinning room with a modern chandelier and TWO sets of French doors leading to the back deck. Directly off the kitchen is a large laundry room with a door and pet door leading to the outside. The laundry room contains a sink, cabinets, shelves, tile floor, counter space and plenty of room for a washer and dryer, as well as other household necessities. A second living space can be found adjacent to the living/family room. This room contains TWO sets of French doors leading outside and a a wood burning heater. Central air and heat are also connected to this room which needs a few finishing touches such as moldings and floor covering. (Sellers were renovating house prior to being transferred with his job.) The foyer, hallway and all 4 bedrooms have the same beautiful wide plank laminate as in the family room and dining room. All bedrooms have ample closet space, lots of windows and a ceiling fan. Two of the bedrooms have built-ins, including desk, shelves, and drawers. The master has a walk-in closet and a small attached bathroom. A full size bathroom and linen closet are located off the hallway. This spacious house also contains a 689 SF finished “walk out” basement with a large open room, bathroom and two bedrooms/offices. The possibilities for extra living space are endless! 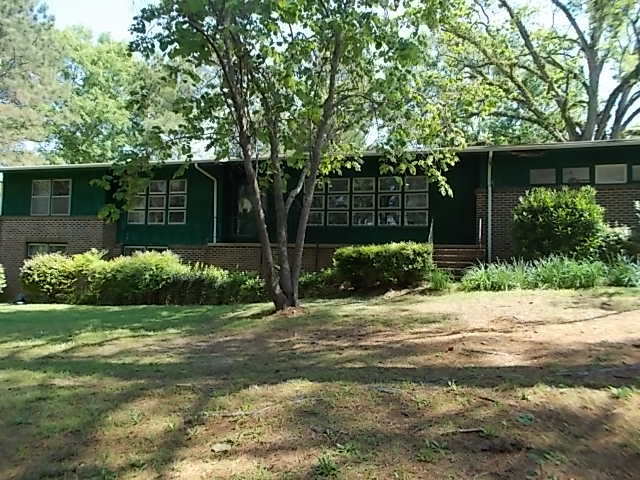 This ranch style house features brick and wood siding, shingle roof, slab foundation, central heat/air, some storm windows, septic system, huge detached carport/entertaining space, storage building, back deck, front porch, beautiful private lot, Alabama Power, Thomaston water. Call Debbie at 334-217-0594.